The QContactSelector class provides a way of selecting a single contact from a QContactModel. 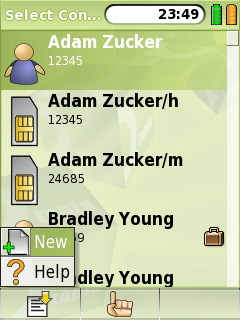 In addition, the user can optionally be allowed to indicate they want to create a new contact, if none of the existing contacts are suitable. The following image displays a QContactSelector with the option to create a new QContact highlighted. Constructs a QContactSelector with parent parent. If showCreateNew is true an action will be include to allow the user to create new contacts. Contructs a QContactSelector with parent parent. Returns true if the dialog was accepted with an existing contact selected. Otherwise returns false. When selection of a contact occurs, this signal is emitted with the contact selected. Filters events if this object has been installed as an event filter for the watched object. Returns true if the event is filtered. Otherwise returns false. Returns true if the dialog was accepted via the option to create a new contact. Otherwise returns false. Returns the contact that was selected. If no contact was selected returns a null contact. See also contactSelected() and newContactSelected(). Returns the text entered when the dialog was accepted. Requires that accept on text is enabled. If enable is true pressing select while filter text will accept the dialog even if no contact from the list is selected. If enable is true an action to create new contacts will be visible in the context menu. Otherwise the action to create new contacts will be hidden. Sets the model providing the choice of contacts to model. Returns true if the dialog was accepted with filter text entered but no contact selected. When the dialog is accepted with text entered, this signal is emitted with the text previously entered.